Built in 1628 for Mary, Dowager Countess of Home, Daughter of Lord Darley. 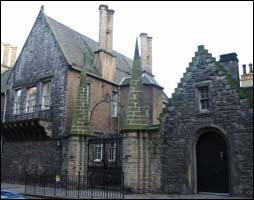 Mary's daughter Margaret, (who became Countess of Moray), inherited the property in 1643. The house remained in the family until the mid-ninetheenth century. East of this lies a high-gabled building with balcony, presumed to be the original mansion of Lady Home as her insignia is present above the central window. The house, noted visitors such as Charles I and Oliver Cromwell also hosted the wedding to the son of the Marquess of Argyle. His hated rival, who was marched past the residence on his way to trial. Upon seeing this the wedding party were said to have spat on the poor fellow from the balcony.